These days it’s easy to see the draw of vacation ownership. With hectic work lives and increasing cost of vacations, more travelers are seeing timeshares as a viable alternative to the traditional vacation. For those looking into vacation ownership, timeshare resales are a great option to save money while still getting most of the same benefits. We’ve broken down everything you need to know before you decide to buy or sell a timeshare. Timeshare companies have begun to offer an abundance of perks and special programs for owners. It’s now possible to travel all over the world through your timeshare purchase. That’s right, many timeshare owners are no longer tied to a specific unit or week. 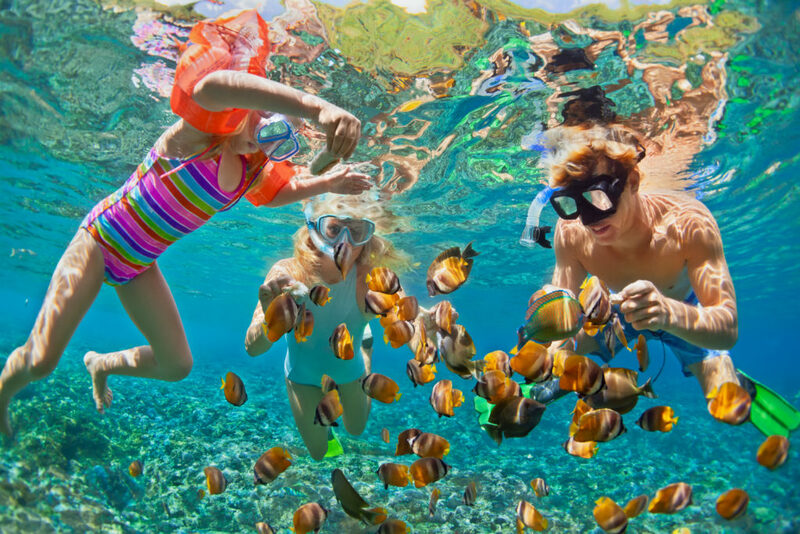 Points-based systems allow owners to exchange the value of their vacation ownership for stays at thousands of resorts around the world using vacation exchanges. This type of flexibility, although not traditionally associated with timeshares, is now the norm. 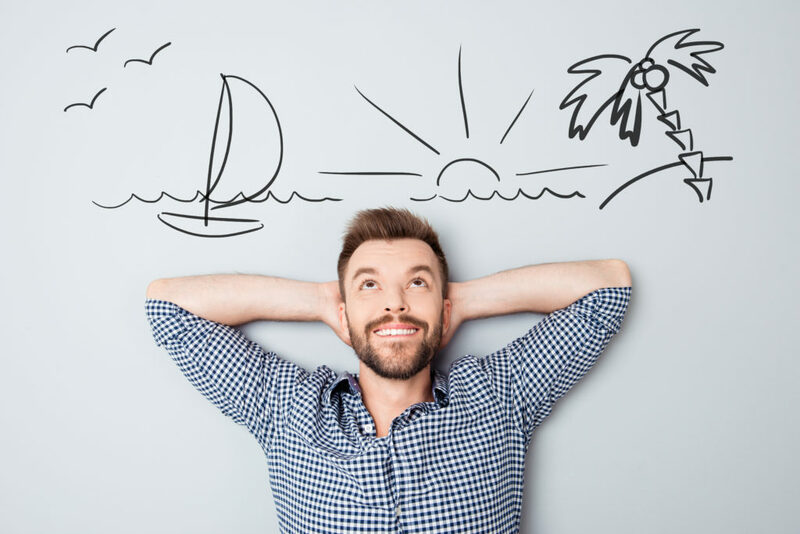 Despite the growth of the timeshare industry, sometimes financial or personal circumstances change and an owner makes the difficult decision to offload their vacation ownership. Use this guide as your go-to resource for understanding the timeshare resale industry from the inside out. Before you buy or sell a timeshare, these are the important things to know. First Things First: What is a Timeshare? At the most basic level, a timeshare is a way for travelers to guarantee their vacations year after year. This ownership can come in many forms. In fact, there are several types of timeshares: fixed week, floating week, fractional ownership, biennial ownership and points-based timeshares. These property types can also be deeded or non-deeded properties. Nowadays, most resorts offer deeded ownership. A deeded property means that you own the property for life and are able to pass it on to your children and grandchildren. Non-deeded properties can also be referred to as right to use timeshares. This means you own the timeshare until a specified time in the future. So, why would someone want to buy a property they must share with others? It’s simple. Dividing the property between multiple owners lessens the cost of the purchase. And since most people don’t vacation year round, sharing the property with other owners when you are not using it just makes sense. If you’re on the market for a timeshare, you might have noticed that there are a lot of options. It can be hard to differentiate between the types of ownership available to you. 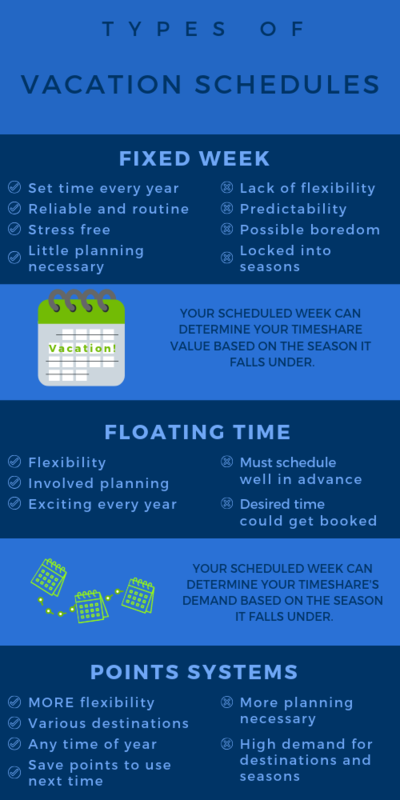 Here’s a breakdown of the 5 types of timeshares. Fixed week timeshares are the “traditional” timeshare offerings. Purchasing a fixed week timeshare means that you acquire usage in the resort for the same week each year. Recently, the industry has largely moved away from this type of ownership. Still, you can find fixed week vacation ownership both on the developer market and the resale market. Floating weeks offer a little more flexibility than the fixed week model of vacation ownership. Purchasing this type of timeshare allows you to visit the resort during a specific resort season, depending on the resort’s availability. Typically there are reservation windows in which an owner is expected to reserve his or her week. Fractional ownership is not a concept limited to timeshares–it is frequently used as a means of purchasing luxury items such as yachts and private planes. Typically, owners purchasing fractional ownership in a timeshare own part of the title and may be eligible for longer use times than owners who purchased other types of timeshares. Owners who purchased biennial timeshares may use their units on even or odd years, meaning it is available for use every other year (EOY). This is specified at the time of purchase. Because it is not an annual vacation dedication, some might find the value to be half as much as fixed or floating weeks. However, biennial properties are sometimes half the cost and can be a great option for irregular travelers. Perpetual ownership functions like a renewable membership. While it is a non-deeded type of ownership, the membership automatically renews at regular intervals, giving you vacations for life. Families wishing to pass down their timeshare to those part of their estate might choose perpetual ownership. Points-based vacation ownership is a concept most major resort developers have embraced. While staying at the same resort during the same week may work for some owners, many timeshare buyers want more flexibility. With a points-based timeshare, vacationers choose whether they want to use their points at their home resort or exchange them on a vacation exchange network. Points work like a currency. The amount of points your timeshare is worth depends on a number of factors including the size and type of your unit, the ownership’s usage frequency, the season of ownership and the popularity of the resort. Vacation exchange networks can be internally managed by the resort developer or an external third-party company. Many developers partner with third-party vacation exchange companies so that they can provide owners with nearly endless vacation choices. How do Timeshare Seasons & Weeks Work? If you’re on the market for a timeshare resale, you may have noticed that some are assigned a season. Common season designations include platinum, gold, silver, red, blue and yellow. Often, the season determines the price of your timeshare and how many points your vacation ownership is worth (if you are buying into a points-based system). Colors also vary by resort. For example, a red season in timeshare usually means a more popular week owned, but this could mean the opposite somewhere else. Always check with the resort before buying so you know how valuable your week is! Resorts typically assign a number to each week starting with week 1 in January. You can use this reference to see which week is right for you. Although check-in dates vary by resort, this calendar should give you an idea of when to plan your vacation. Keep in mind that every few years, a “week 53” appears. Week 53 is usually added to week 52’s ownership, making week 52 one of the most valuable weeks available. Now that you’ve familiarized yourself with timeshare terminology, you can take a look at a contract and understand your possible ownership. Knowing what you own is also key to starting the resale process. You’ll need this information when you call one of our experienced timeshare consultants. Keep an eye out for Part II of the Ins and Outs of Timeshare Resale to learn about how you can leverage the expense of your timeshare to travel the world, how you can find the right timeshare for you and learn all about the closing process. 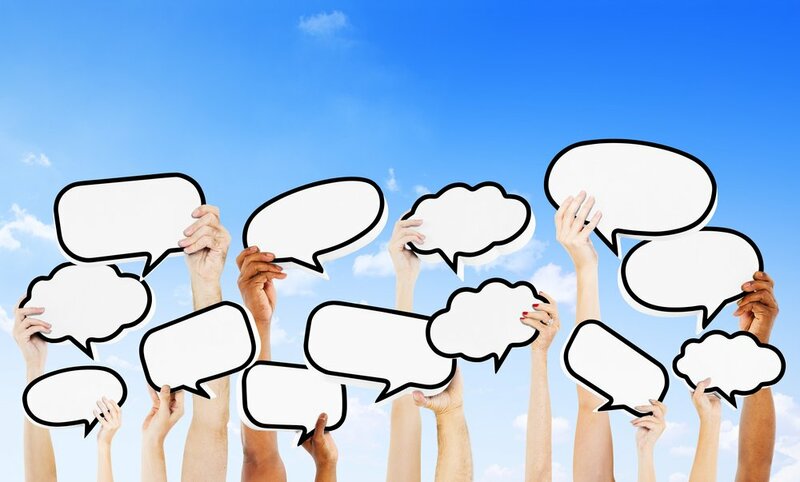 Are you interested in selling your timeshare or buying a timeshare on the secondary market? Give one of our qualified timeshare consultants a call at 1-800-213-7733. Timeshare Cancellation Or Timeshare Resale? What’s the Best Option for You?